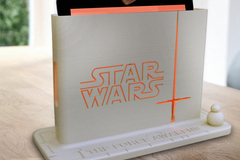 While charging your tablet in this accessory you have a lucent StarWars lamp. Load a free app f.ex. "LightTemperatur" or "flashlight" on your device, make it lucent and put it into the stand. Choose the colour you like, suitable to the colour of your room or to your mood. To charge your device while it works as a mood-light put the charging-cable through the slim opening on both sides of the stand. At the back of the stand you can find an opening to insert your device easily. If you like to use the lamp without your device, you can use a self-adhesive LED-stripe, just like a real lamp.